‘Detail’ seems to be the watchword by which this album was conceived and constructed; I hesitate to say that it’s all about the arrangements, as it’s clearly about much more, but a conspicuously enormous amount of effort has gone into them. Ideas abound in every area, in an album which is clearly a paean to much of the best music that progressive rock has produced; stylistic cues come from many sources, including folk, jazz and sixties psych-pop, and melodic or harmonic devices are presented in a rapidly cycling kaleidoscope of nuanced affective conditions. However, it is in the constant, subtly modulated manipulation of timbre and texture that Use and Ornament stands out most clearly. 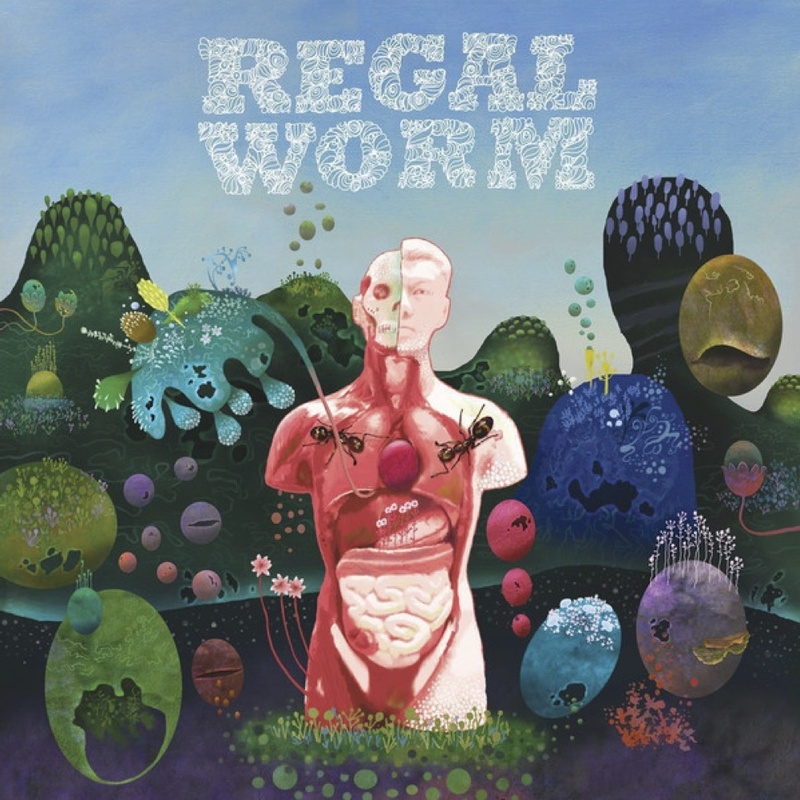 Regal Worm is a nom de plum of Jarrod Gosling, a member of contemporary proggers Henry Fool and half of noted psych-pop duo I Monster; this project is his opportunity to express the prog-headedness he’s been nurturing since the early nineties, but he says that his first love was 2 Tone, and there is a certain streak of New Wave sass and punkish abandon running through the music. Lest I give the impression that this is some kind of pronkesque psych-math assault, however, I should point out that we are discussing a man who possesses his own Mellotron; his music is an effective fusion, inasmuch as you can hear all kinds of influences in it (regular readers will be aware that I do not sully my reviews with lists of band names), but it sounds stylistically coherent and rooted, as though it sprang from a scene. Its inventions are presented with the insouciant air that these are quite normal things for a record to do, that bands sound like this all the time, and Gosling is just playing what happens to be in the air. There is a difference (one to which I don’t attach any particular valuation) between eclecticism and synthesis in art; while you can play ‘spot the influence’ with this album, it’s really only the obsessive music spotter that will hear the album as an assemblage of disparate materials, and it is not at all eclectic to my mind. It is very much a work of stylistic synthesis, in which every identifiable antecedent has been thoroughly integrated into and assimilated by Gosling’s artistic vision; styles are forged from whatever happens to be lying around at the time (e.g. mento, small group jazz, jump-blues and early soul were endemic in Jamaica in the 1950s), and Use and Ornament evinces the same stylistic conviction as early ska, or any other supposedly seminal era in the recent evolution of music. It’s not hard to identify this as progressive rock, and it might not have sounded outrageously transgressive in the 1970s, but it’s decidedly a tissue of Gosling’s own listening. Probably the most prevalent formal element in these compositions is the careful manipulation of rhythm: metrical ambiguities abound, cross rhythms fertilise feel changes, and odd times are employed as casually and as naturally as four to the bar beats. This is not to say that you’d listen to the record and think that it was all about rhythm, however; on the surface it sounds like it’s all about grooves and tunes, and I suppose, essentially, it is. The arrangements employ a wide variety of textures, and the relationship between the top and bottom of the ensemble is never predictable; in ‘Cherish That Rubber Rodent’ there are passages where the melody stretches out long notes in lyrical phrases supported by tight, active groove, and others where all the instrumental forces are unified in tight, rhythmically additive phrases. The rhythm section is essentially the bass and drums, both credited to the multi-talented Gosling, which produce solid but very relaxed feels with a nonchalant disregard for the challenging nature of the rhythmic and metrical material; the harmony is not generally filled in with guitar, or any kind of block chording, but by rich and complex counterpoints and melodic homophonies of more or less simple part writing, shared among the Mellotron, various wind instruments, synthesisers, and other keyboard instruments. Of course there are exceptions, such as the stabbing organ riff in ‘The Mardi Gras Turned Ugly In Seconds’, but for the most part this music is fully orchestrated, written from top to bottom, rather than relying on the standard phraseologies of the various instruments it employs. Textural density varies from the austerely spare, such as the vocal passage in the 4th movement of ‘Confession From A Deep And Warm Hibernaculum’, with its subterranean drones, to thick and syrupy, like the climactic freakout in ‘Morning Sentinel’. There is often brass or sax at the top of the texture, and a commonly employed (and extremely effective) device is to write the brass and bass in unison, bracketing the rest of the arrangement between them. Formally the music is episodic, with one set of ideas succeeded by another, possibly recurring in the short term, but usually not conspicuously revisited or developed thematically; this should not be taken to imply that it is disjointed, or assumes a short attention span, however. In fact the album is very much about the long game, with two extended compositions at its creative heart, the aforementioned ‘Confession From A Deep And Warm Hibernaculum’, and the even more epic ‘6:17PM – the Aunt Turns Into an Ant’. It is, in fact, not just these two suites that express Gosling’s interest in the longer compositional time-frame, as the whole album has a narrative coherence that keeps the listener closely engaged, and throws light on the earlier material as it reaches its denouement in the psych-pop melodicism of ‘Klara Till Slutet (Main Title Theme)’. However, the two long pieces, particularly the complex and serpentine ‘6:17PM – the Aunt Turns Into an Ant’, display a real interest in story-telling, in the kind of programmatic approach to composition that is more usually found in the classical tradition; clearly such fancies are a byword in progressive rock, but more often than not the longer narrative is stitched on lyrically to a series of unrelated songs, or segues and connecting passages are used to unify a set of disparate material. The Regal Worm approach seems to be to start with the story and then to write the music, or at least, that’s the impression it gives; of course the overt story (Aunt finds herself formically metamorphosed, negotiates spilled darjeeling lake, encounters ant tribe, finds happiness with outcast from said tribe) may have succeeded the music, but the music is obviously formed around an affective narrative, a deliberate sequence of feelings and moods. There are clear associations to much of the musical material; sixties psychedelia, seventies avant-prog (definite hints of the Canterbury scene), borrowings from the jazzy/Brazilian floaty sounds of sixties TV themes, jaunty pop-folk, and more than it’s worth enumerating or than I have probably detected. This gives the listener some signposts, it lets them know we’re in retro-psychedelic territory, and if that conflicts with their personal prejudices, it lets them off the hook from listening closely enough to get at the real meat of the music. For those willing to pay the close attention that Use and Ornament deserves, there is a complex, psychotropic mandala of swirling, shifting sonic beauty awaiting discovery. If you basically dig this sort of thing, then there is a pretty, beguiling and entertaining surface laid out for your delectation, but the more profound rewards the album has to offer will require a little more effort, both for the dyed-in-the-wool fan of psychedelic or progressive-rock music, and the more generally engaged, open-minded listener. It is without doubt a complex and serious artwork, the product of a concerted and single-minded creative effort, and a staggeringly close attention to detail. Every moment of the record is as elegantly and baroquely ornamented as a Persian rug or a mid-period Matisse. I rarely receive a review submission that is such an unalloyed sensual pleasure to listen to; this album feels like a feast for the senses, and I have to remind myself that it’s only my ears that I’m listening to it with. A truly beautiful piece of art, and an impressive creative achievement.